It was inevitable that I’d grow up to love plants. When I was a kid, my mom was constantly planting roses, peonies, and other flowers around the perimeter of the house. My dad also would spend whole days working on his garden, growing veggies, killing weeds, getting sun burned and engaging in epic battles against hungry bunnies. I suppose it influenced me a little? So it’s no wonder that despite living in a small apartment in the midst of much concrete, I must still find ways to garden (I mean, even a neighborhood called “Forest Hills” has much less green than what I grew up with in the suburbs.) 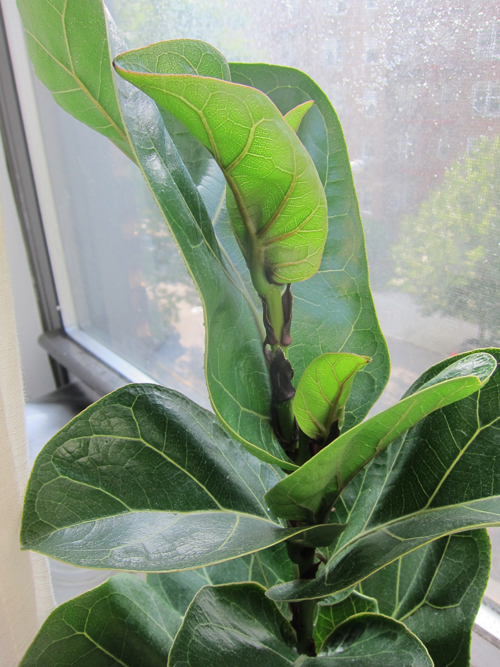 My latest addition to my windowsill garden is my new fiddle leaf fig tree! I’ve been obsessed with these trees for quite some time now. Their large expressive leaves just have so much character! 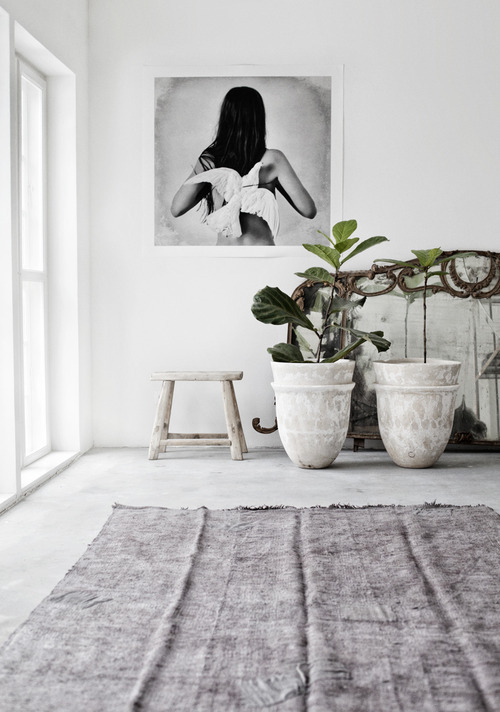 And the many times they’ve been featured in design blogs only serves to reinforce my love. Here’s my little guy when I bought it back in April. It was tiny and arrived with only four leaves. 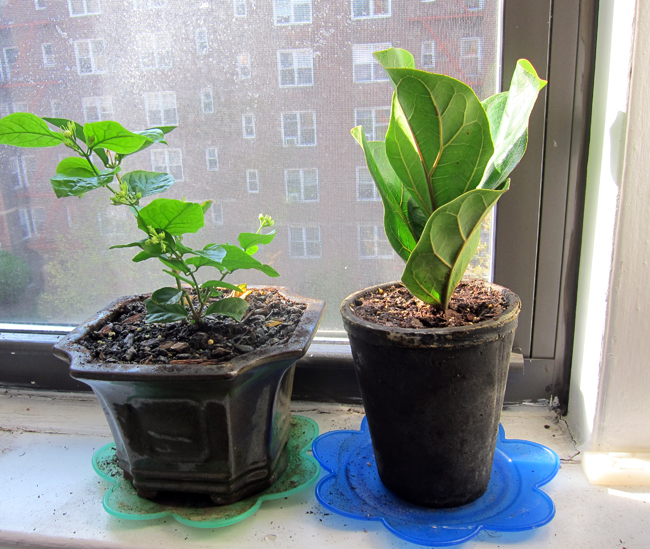 fiddle leaf fig on the right, jasmine plant on the left. This was my first time growing a fiddle leaf fig, so I made sure to do my homework. They prefer bright morning light, so it would have been happy on an east facing window, but I have limited options when it comes to windows. I ended up putting it on a south window (slightly south east, but mostly south), and it’s been quite happy there. I also read that they are supposedly slow growing and do not tend to branch indoors unless pruned back. So if you don’t just want one tall column of leaves, you have to cut it back to give it that full tree-like shape. After reading this, I assumed I would not need to prune back until next growing season in a year. However, this plant is NOT slow growing. In a matter of two months it tripled in size! At this rate, I felt like I should prune sooner than later to encourage branching. So 1.5 months ago, I chopped off the top bit which included two leaves. And why settle for one plant when you can have two? I decided to use this cutting to propagate a new tree. Cloning can be SO FUN! Propagated plants also make great affordable gifts. You just have to make sure you have a clean sterile cut, then dip the open wound into some rooting powder like this product. The instructions on the container say the next step is to stick the cut end into some soil. I’ve never had luck this way and prefer to start my roots in water and transfer to soil later. Then you just have to be patient and wait. Don’t be discouraged! It will look like nothing is happening for about a month. Just make sure that the water never dries up from the cup. In about a month, you could see the buds of new roots! Oh, and the mama plant is doing great too! The pruning really did work, and it is now growing two new branches! Hopefully it will eventually get big enough that I can display it on the floor, rather than up on the windowsill. They don’t like dry heat. The soil should be dry to touch between watering. Occasionally clean the dust off the leaves for maximum sun absorption. Fertilize from spring to autumn. But on the whole, its been a really easy plant to take care of. On a side note, I’ve been obsessed with this book. 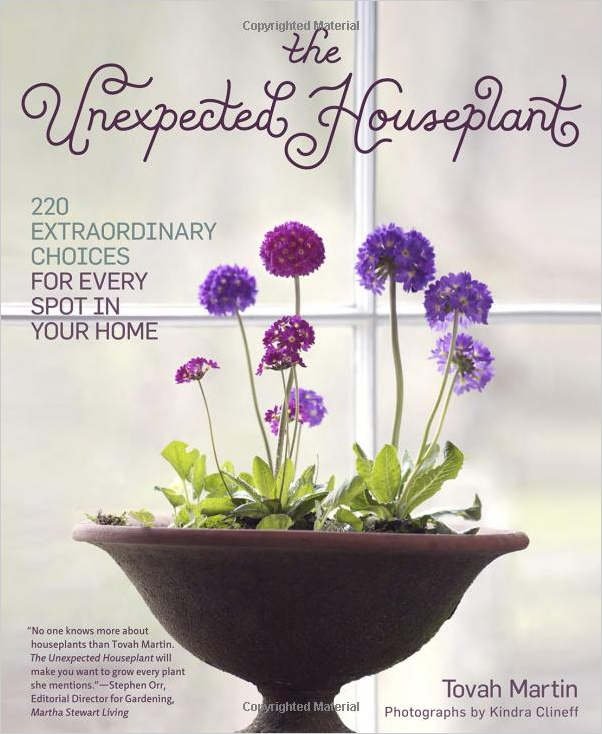 It has very whimsical descriptions of the personalities of various house plants, and describes the care and needs of those plants in a way that is easy to understand. The photos are also very inspiring. 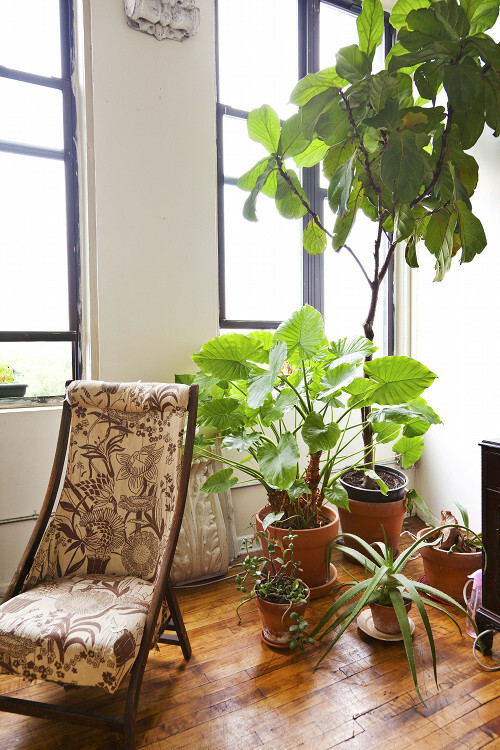 And for your enjoyment, more great photos of fiddle leaf figs from around the blogosphere. 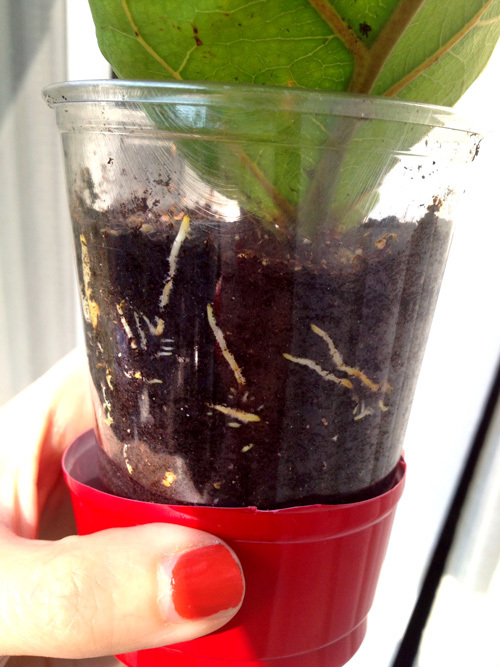 **EDIT (7/22/13): I checked on the propagated plant again a couple days ago, and the roots are really growing rapidly. You can see how they are starting to fill the cup. I’m sure I’ll have to transplant it in no time. Hopefully once the roots are established, it will start to grow some new leaves. **UPDATE (9/4/13):The main plant is getting huge now! Both new branches have grown substantially and the whole thing has gotten much taller. I picked off some of the lower leaves to give it a more tree-like shape. I think I may need to prune again soon for more branching, but I’ll probably wait until the spring during growing season. I gave the little cutting away to a friend last month. I didn’t take any pictures, but when I gave it away it has a thriving, established root system, and it had grown three or four new leaves. 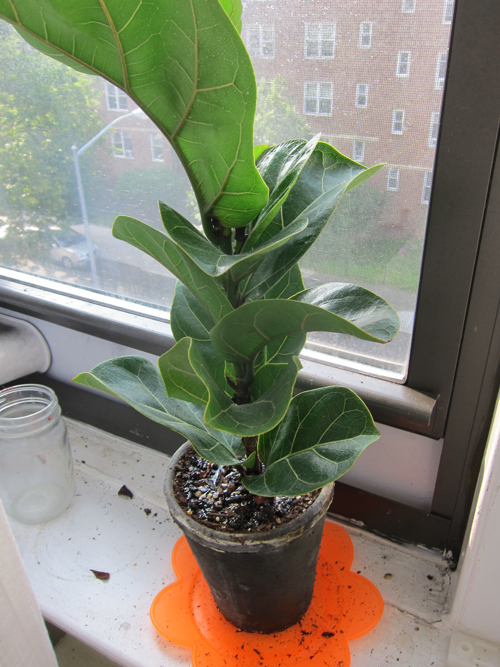 For more updates on the growth of my fiddle leaf fig, check out Part 2.
that looks amazingggg!!! i am always trying to propagate! and my parents are SO annoyed!! 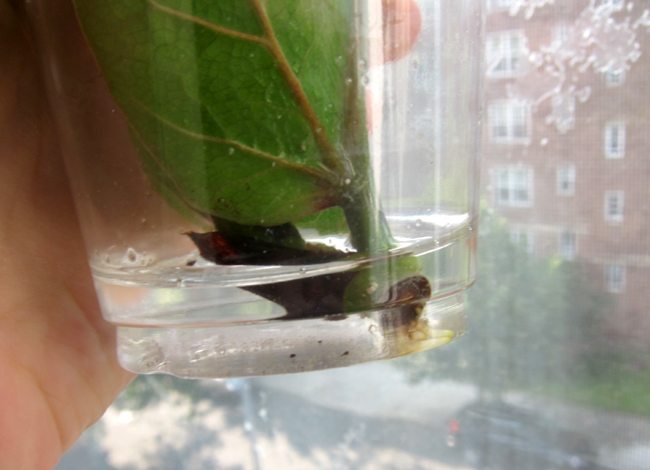 i have two avocado pits growing right now…and some other random clippings going! want to swap? 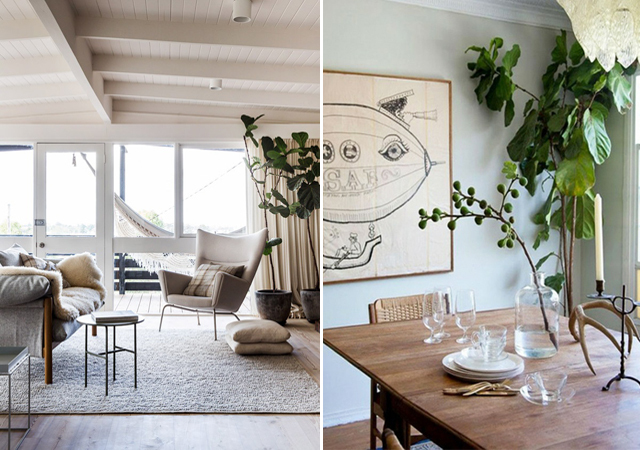 Love fiddle leaf fig tree! I just bought one and I love it! Hi- was curious where you got your plant and how tall it is now? do you use plant food for your fig tree at all? Also, how long after your pruning did you see branching? My fig tree is relatively new, so apologies for all the questions 🙂 thanks! I’m happy to answer those questions for you! I’d say right now, from the top of the soil to the top of the plant is about 24 inches tall. I bought mine on Amazon! (http://www.amazon.com/gp/product/B003GMD1Y6/ref=oh_details_o00_s00_i00?ie=UTF8&psc=1). I’ve actually had very good experiences buying from Hirt’s Gardens via Amazon. You have to be patient and grow your plant from a small size, but its way cheaper, and so much more fulfilling. I know people who spend $50 for full size trees. Not my style. In terms of plant food, I use this: http://www.amazon.com/Schultz-9-Month-Purpose-18-6-12-2-Pound/dp/B00BARLHQ8/ref=sr_1_fkmr0_1?ie=UTF8&qid=1378492206&sr=8-1-fkmr0&keywords=vigoro+6+months+plant+food. Since its a slow release formula, I only fertilize in the spring following the dosage instructions on the label. I’d rather under feed than over feed, so when in doubt, feed less. 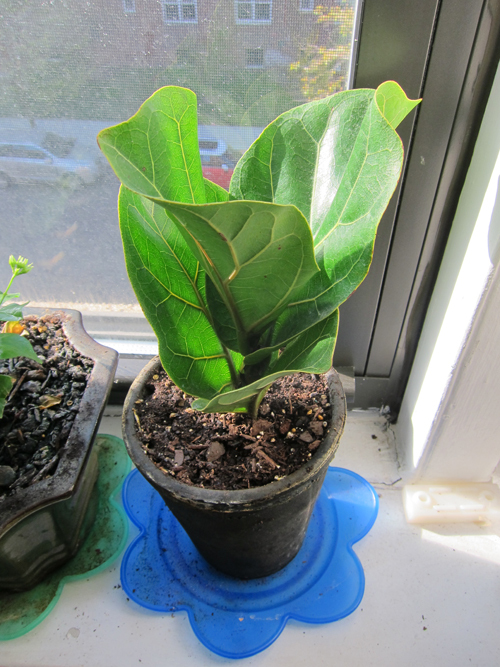 so happy to have found a well documented post about pruning a fiddle leaf fig to encourage new branching! i would like to encourage branching on mine but am not sure where exactly I should be cutting….mine is a tree shape with a main trunk and 4 branches growing off the top of the trunk. how exactly do you cut to encourage branching? any tips would be great! Hi, thanks for the great information! Unfortunately my fiddle leaf fig is dropping leaves like crazy and I can’t figure out why. I think I’m watering appropriately. Could it be bugs in the soil? I treated it a few weeks ago and noticed some dead ones on the surface afterward. Does my pot need to drain? Could it be rot? The nursery where I purchased the tree was not helpful – I’d love any feedback! Quick question! Do you by any chance know what it means if my leaves have brown spotting on them? I actually bought it like that from Ikea, and I’m afraid they’re already dying. They’re getting plenty of sunshine (and I thought possibly too much, so I moved them from my bright/sunny living room to a hallway right off of it). One thing I can think of is that I didn’t repot the little bugger… could that be why?? Abby, bugs in the soil could mean that the soil is too wet. Often wet soil attracts fungus gnats that will not harm your plant, but love to feed on the moist decomposing organic matter. 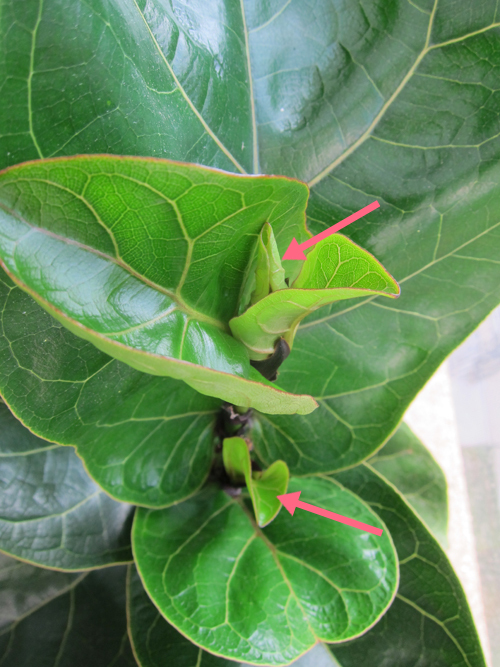 I do know that Fiddle leaf fig trees like to dry out between waterings which usually prevent the bugs from surviving. my plant usually gets bone dry for at least two or three days before I water again. Also, good drainage will allow your soil to more properly dry out between waterings. 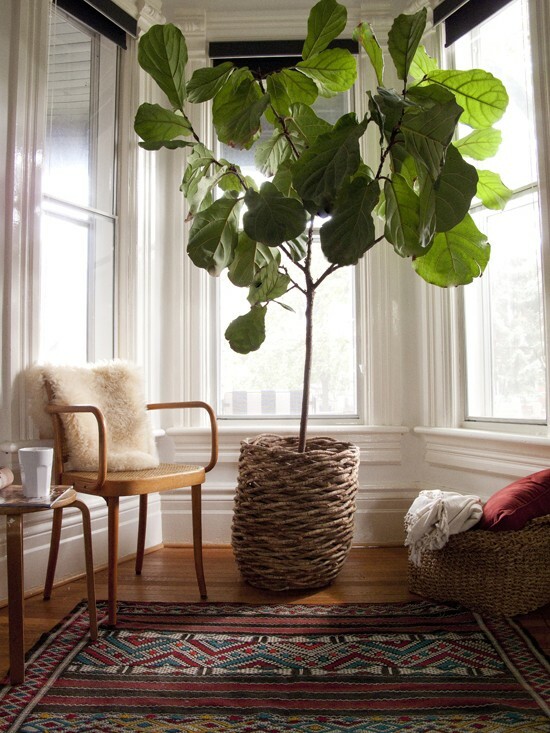 the fiddle leaf fig hates having its roots soaking in water, so that is very likely the problem if the tree is getting the proper amount of light. Christina, I’m also new to raising this particular plant, so I haven’t encountered the brown spotting myself, but too much light sounds like a reasonable guess. What direction is the window facing in your home? If it is a south facing window, the sun may be burning the leaves. I think i was able to get away with a south facing window in my home because I live in a neighborhood with a lot of tall apartment buildings, which probably help block out some of the sun. These trees usually prefer an east or west window. 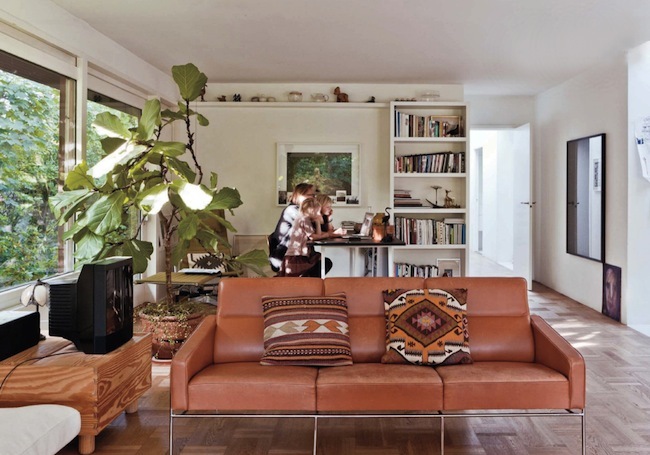 If you really want to keep it by the window where it is, you could simply move it a couple feet from the window (like you mentioned), or cover the window with sheer curtains. I don’t think that repotting is the answer if you JUST bought it. Usually is good to allow a new plant to acclimate to a new environment before repotting as this can be too much of a double whammy of trauma. repot once you’ve found that its thriving in its new home. Marissa, that’s so sad! Again, with my experiences in raising indoor plants, I’ve found that knowing the direction the window is facing makes a big difference. I’ve seen different sources tell me bright light, filtered light, moderate light for the same plant, but once i knew, “use a west facing window,” that was much more well defined for me. definitely try for west if you have it. Sometimes also, if it has adjusted itself to a certain environment (like the dark interior of a home depot) you have to slowly expose it to the new environment of brighter light. Slowly increase its light exposure over a period of a few days. thee much light all at once may have been too much of a shock to its system. I’m not sure if you will be able to revive your plant, since I really don’t know how far gone it is, but it might be worth trying. Gosh! i’m so jealous of yours! mine is never seems that happy with me nor my room. I left my place for 4 days and three leaves fell off and some of them are browning and getting all crunchy. Oh well….. best of luck with yours but from the looks of it you don’t need any luck, you are an natural! Oooh, I’ve been lusting after FF’s for a while now but haven’t ventured out to buy one. I’ve got 2 house plants now growing that seem to require little water/attention so MAYBE i could handle a fiddle. I’m now sure. 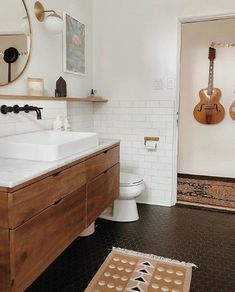 But they do add something oh so wonderful to a room! I didn’t know you could transplant like that. Very cool!! yes! i love that you can propagate them! Most people will recommend air layering for propagation, but the water method works well for me. you just have to be very delicate when transplanting to soil as the roots may be fragile. Thanks for the detailed post! I bought a couple from Hirt’s two weeks ago and was wondering, how soon after receiving yours did you repot? I don’t want to shock them, but I figured I’m supposed to. good question. I re-potted my tree about a week after I got it in April. I think I got lucky though. I recently read that you should wait until the growing season to re-pot a fiddle leaf fig (which starts in late march, early Aprilish?). These trees tend to go dormant in the wintertime, and you want it to be in it’s active growth stage so that it can bounce back from any shock or trauma. It begins active growth in the early spring and continues through the summer into early fall. If I were you, I’d wait another two months before re-potting to play it safe. hi! 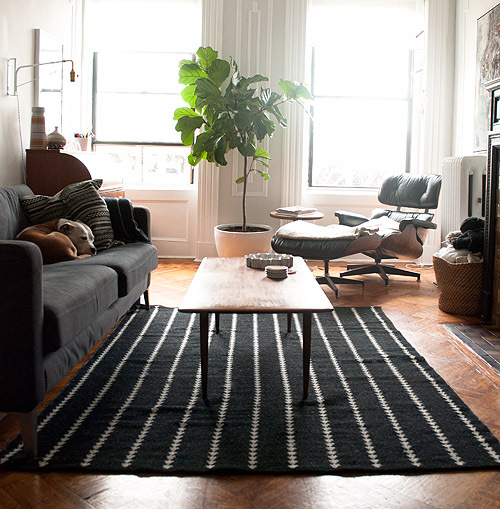 i love your post – just got a new fiddle leaf fig plant yesterday, and am really hoping i can keep it alive. 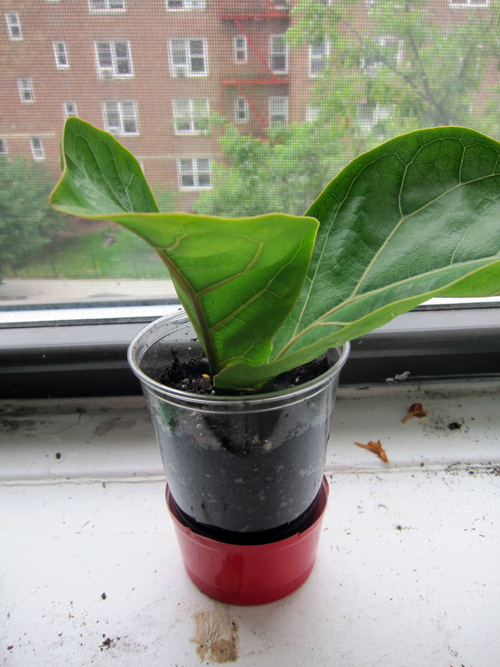 do you know if propagation will be effective if i cut off a small section of 2 connected leaves from the plant at random (even if it’s not in its growth phase – right now it’s wintertime so the plant is dormant, i think). 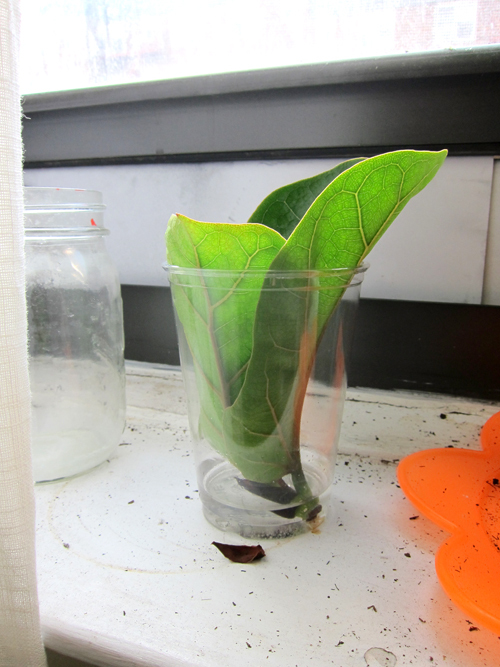 in case my plant can’t stay alive…i’d like to have a backup propagated plant. thank you!! hi!! sorry for my late reply! I’ve been on vacation! Anyway, I’m not sure about propagation during the dormant phase (never tried!). I feel like it can’t hurt to try. In any case, spring is around the corner and I’m sure they’ll start growing again soon anyway. Hi, my little sapling has some tiny holes in a couple of the leaves. Any ideas? P.S. My cat likes to nibble, but not sure if that’s the culprit. ooh, that’s tough, I haven’t encountered holes on my tree before. Kitty sounds like a likely possibility. My cat used to love to nibble too. I purchased a fiddle from the same Amazon vendor about six months ago, which has started growing rapidly after I re-potted about a month ago! I would love to see a picture update of your little guy so I can see what’s in store for me in the next few months! Hi Cheryl- my fiddle has very thin trunk. Any suggestions how to make it thick & strong? I haven’t been feeding it so I”m thinking it could be it. Indeed, I have had a lot of success propagating from cuttings simply using a glass of water too. But I like to wrap some aluminium foil around the glass to create a darkened environment….then pop it into a warm space like my windowsill and wait for the magic to happen. 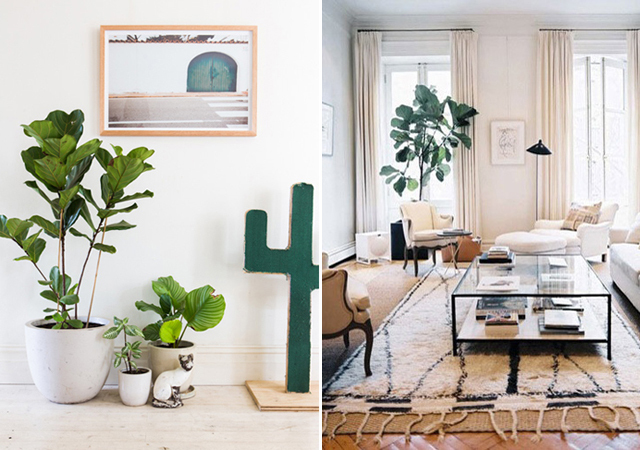 Stumbled upon 2 little treasures at a car boot sale last weekend….Not one, but two fiddle leaf fig trees approximately three feet tall. Asking price?…$5 each, needless to say I snapped up both of them. These are my first fiddle leaf figs, as I haven’t been able to afford to by one at retail price. Repotted them yesterday, and am now searching for appropriate names for them……as I find that named plants tend to thrive just that little bit more. I will be sure to update here about their progress in the coming months. Good luck and happy gardening. Olya, sorry for the delay in my reply. Not feeding it can be part of the problem. How much sunlight is it getting? Most plants will become “leggy” when they do not have enough sunlight. Think of it like… they are stretching to get above whatever is blocking their sunlight. Hi, thanks for putting together all this information (and to the other contributers) – I live in Perth, Australia and I’m going to collect some cuttings tonight to propegate…exciting! I’m so sorry I’ve been so bad about updating the blog lately!! I had emergency surgery for a ruptured ectopic pregnancy about a month and a half ago and am finally feeling normal again now. I hope to update soon! Unfortunately this means my tree was slightly neglected for a little while too. But I’ll try to post something soon. Hi Cheryl, hope you’re fully recovered from your surgery! Am I correct in assuming that you put drainage holes in the clear cup and put the red base to catch water, or what? I am confused, a newbie, please forgive me, lol. I have a cutting in water right now with roots!!!! and want to put in dirt, a little afraid. What sort of soil? How moist? I was thinking when planting into the soil I should keep it pretty moist, being that it is coming out of just water? Should I use any root stimulator? Sorry, but you seem to know how to do this well and I am thirsty for your knowledge, lol. I have had my tree for about 3 years. it is really slow growing and the trunk of the tree very thin. I have to have a stake to hold it up! Looks like we’re neighbors! I live in Forest Hills as well (67th ave) and just came across your awesome blog – very exciting. I’m going to order that booked you suggested as well..
Silly question, but what can I use to prune my fiddle leaf fig leaves? I’m new to this… Thanks! I used a pair of hand held pruning shears that you can buy at any gardening center. However, you can also just use any blade, and that would be fine too. Hi thanks for all the great tips on propagating. I have successfully replanted a baby fiddle leaf fig and was wondering how often I should water it? It’s so small should I water it twice as often as my big fiddle leaf? i have had my tree for a little over a month and all of the bottom leaves are getting pretty brown starting from the edges. I am going to start using a plant nanny to see if that helps with the watering. I know you mentioned earlier that it should get western exposure. My tree is currently between two west windows that have very sheer curtains. 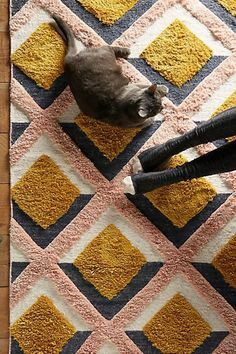 Do you suggest moving it directly in front of one of the windows (with curtain as protection) or is it fine in between them? Please help! I bought a decent sized FLF about 5 weeks ago. Since she was pretty mature, I pruned her and placed the cutting in a glass of water ‘in hopes’ of propagating it. It’s been a full month and I am seeing no rooting what so ever. I have replaced the glass with fresh water 3 times in the past month, and have the cutting on the window sill of an eastern facing window, so it is getting plenty of sun in the morning/early afternoon. One thing to note, however, I didn’t use a rooting powder or anything of the sort. The major concern I have is drooping leaves. They cannot hold themselves up, so I’ve been placing small objects under the leaves to offer some support. I did read somewhere that dusting the leaves with a soft cloth soaked in milk is a great habit (they like the calcium). I’ve been doing that with the mama plant, and she LOVES it. Her leaves are so thick and shiny! I never tried it on the baby, I thought I’d let it mature a bit, first. But, today I’ve started feeling a bit hopeless and gave that a go for lack of a better idea. Is there anything you can think of that may be holding back any root formation/causing droopy leaves? Is it too late to introduce the cutting to rooting powder? Thank you in advance! I really appreciate any advice!! I bought a FLF about 4ft tall about 2 months ago. It started forming brown spots on the leaves couple weeks after we brought it home. I did some research on it and been trying to just water it about every 7 days and give it as much sunlight as possible, but I’ve lost about ten leaves so far, and brown spots are spreading on all leaves now. Do you have any idea on what I should be doing? And what type of soil do you use? I would love any advice anyone can give. Hi! 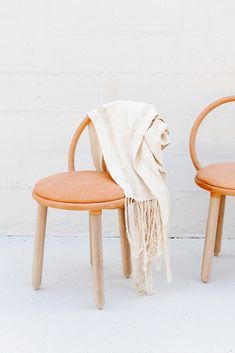 I have just come across your blog and I am so excited! 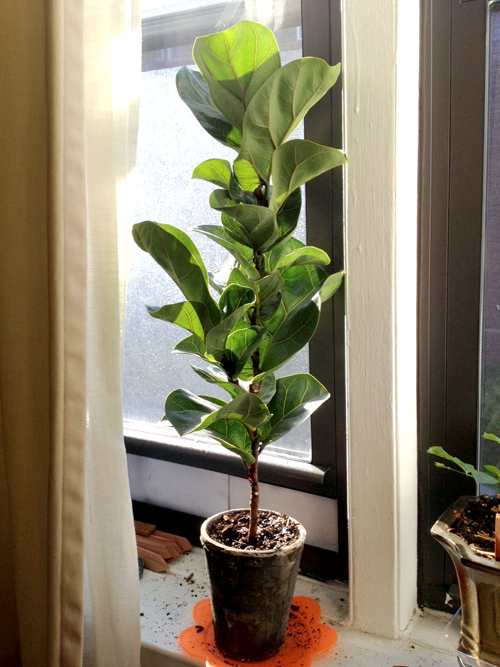 I have recently purchased a fiddle leaf fig tree and I am so hopeful that it will grow! 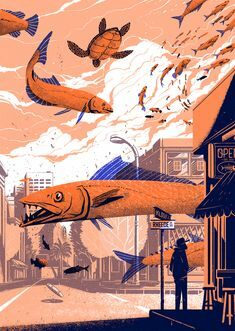 I did have some questions that I was hoping you could help me with? I am needing to repot my little tree(maybe 5 leafs) into a pot other than the plastic one it came in. 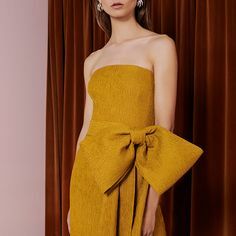 Do you recommend a size? I have read that putting rocks at the bottom of the pot helps with drainage? Any luck with that?